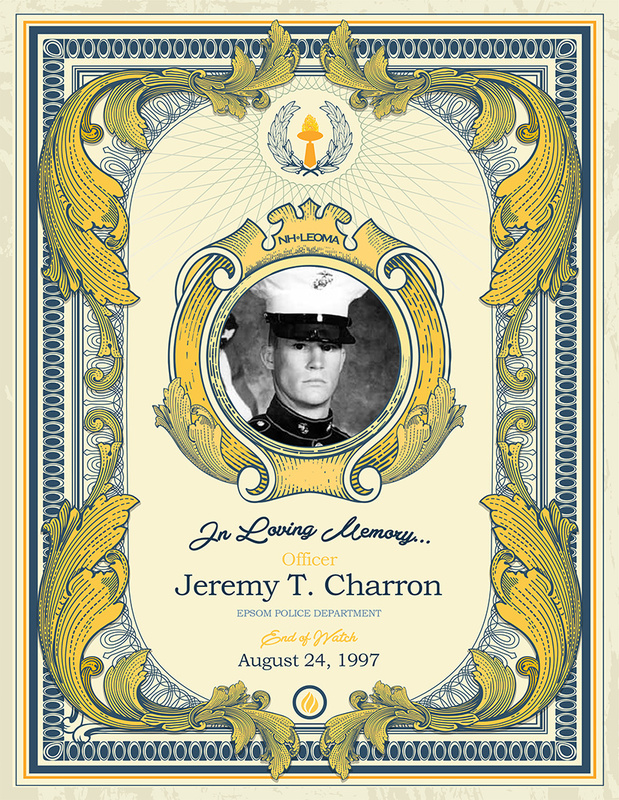 Officer Charron was born in Concord, New Hampshire on March 18, 1973 and grew up in Hillsborough, New Hampshire. He was president of his 1992 graduating class at Hillsborough-Deering High School. He served his country in the United States Marine Corps from 1992 – 1996. He became a member of the Epsom Police Department on November 9, 1996. On August 24, 1997, the morning after he attended the funerals of Trooper Leslie Lord and Trooper Scott Phillips, Officer Charron was investigating the report of a suspicious car in Webster Park. One of the two men sitting in the car fired several shots from a handgun and struck Officer Charron. Officer Charron returned fire, but the assailants drove away, only to be captured by officers a short time later. Although he was wearing a bullet resistant vest, one of the bullets struck Officer Charron in an unprotected area and he died from his wounds. He was 24 years old. He is survived by his parents, Robert and Frances, his two brothers; Robert and Andrew, and his two sisters; Amanda and Bethany.